Strolling along the promenade at Tywyn last week I came across this warning sign which was posted in at least two locations. Both signs had the same error. For all I know there may be lots of Welsh typos in there that my Welsh friends will be enjoying. For the rest of us, I've highlighted the offending mistake. Something seems to have gone wrong when. Sorry. Something seems to have gone wrong when it was translated. It gets worse. 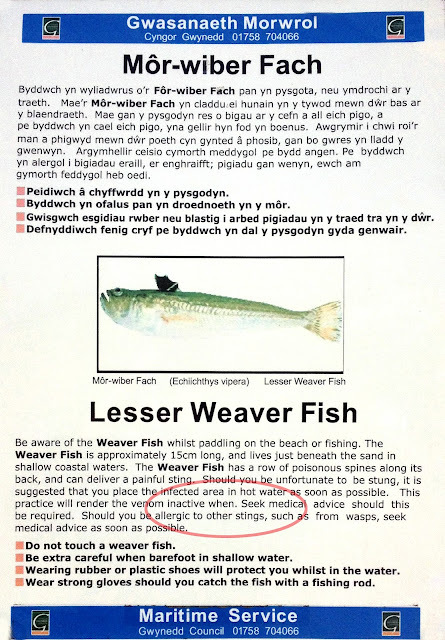 According to other sources [http://en.wikipedia.org/wiki/Lesser_weever], it's not spelt 'weaver' but 'weever'. Good grief, Jon. You're right. That is so glaringly obvious and I never even questioned it. No wonder it gets angry!The 'when' error can be recified by the simple expedient of moving it to the beginning of the sentence when it begins to make sense.